A few years ago I joined a group on Facebook: “50s & 60s Westville”. And with all the mishegas about Facebook and privacy issues, I still enjoy the good things that there… love the jokes, the animal oriented stuff. And of course pictures of family and friends. And I include this Westville Group in the “good” column. And as an aside, judging from the folks who actively post and comment within the site, you’d have to think that Westville had the highest concentration of Jews outside of Jerusalem. But most of the posts spin around places to eat. And as you can imagine there is a ton of posts on the Wooster St “pizza shrines” and of course Jimmies of Savin Rock. No, not part of Westville per se; but definitely within our orbit. Something else you should know, most of the folks who are connected in the Group no longer live in the area. The chief archivist, who posts most of the old photographs, lives in Colorado. But everyone seems keen to hop in with a favorite deli, hamburger joint, pizza parlor… or to debate the finer points of Jimmies’ lobster roll versus Chicks’. I submitted Whitey’s in Guilford (by the water tank, just off of I-95) for roasted clams and corn. 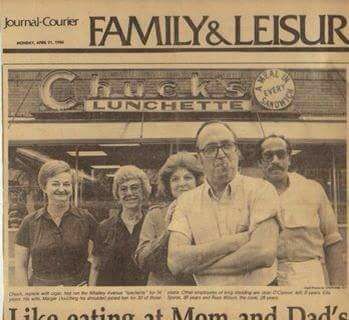 A place that often surfaces is Chuck’s. My experience there was limited to less than a half dozen times. So it’s hardly as memorable for me as it was for you. A recent post included a picture, and here it is… Enjoy!